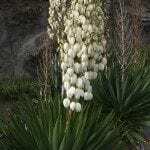 Can yucca plants be grown from seeds harvested from this summer's plants? These are the outdoor plants. Does my husband need to freeze the seeds until starting them in seed pots in Jan. or Feb? What type of growing medium should be used? We live in south central IN. I see a lot growing in the area, so these are winter hardy.